Do you have a bird’s nest under your solar array? Here’s what to do. It is not uncommon to discover a bird’s nest under your solar array. In New England, many bird species begin their breeding activities between April and July. Of these, most will choose to nest in a protected spot in a tree, shrub, building eave, or the ground. Occasionally, however, they may find your PV system a convenient, sheltered spot to raise their young. Generally speaking, an occasional bird’s nest does not pose a threat to your PV system and you can happily let your winged friends go about their reproductive business (Pigeon infestations, much more common in dense urban environments, are an altogether different story!). 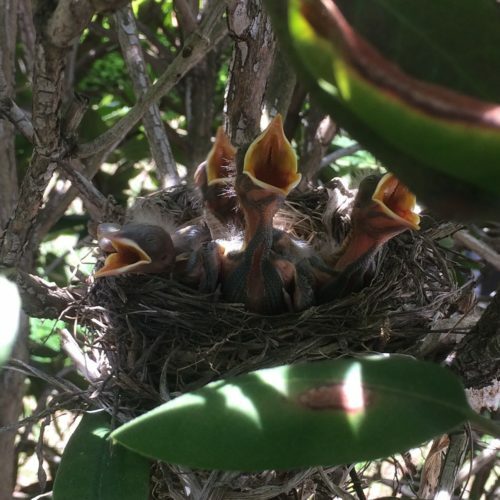 That said, it’s a good idea to visually identify any nests located on or near your array so that the nest and any debris around it can be cleared after the young birds have fledged. Left unattended, bird’s nests may attract rodents looking to make a winter home in the late fall– and rodents, unlike birds, are liable to chew on wires and create bigger problems. If you identify a bird’s nest on the edges of a roof-mounted array or on the backside of a ground-mounted system, it’s a good idea to remove it by late summer. As always, safety first. Be sure to turn every switch on the AC and DC side of your PV system off, use caution and common sense when using ladders, and be careful not to scratch or damage the modules. If you have any questions or concerns, you can always call our Service Team for advice or help if the task exceeds your comfort level. You can reach us either by filling out our Service Request form or calling 413-772-8788.